Replacing the ladder stile at Glencoyne, above the old quarry. 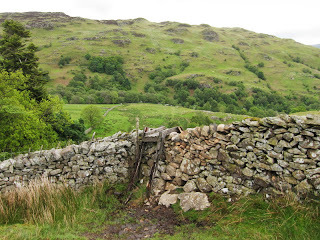 The old ladder stile at Glencoyne Brow was in a sorry state and in need of replacement. Instead of a new ladder stile, putting in a new gate way through the wall was considered to be a better, and safer option. A new gate would be far easier for dogs and their owners to negotiate! It would involve a lot more work to install a new gate, but in the long run........... well worth it. Seen from the other side.....YES! It really is well past its sell by date. The route to and from the old quarry is challenging, especially when carrying up tools and gate posts. The View from the work site. The wall in the process of being taken down to allow room for the new gateway. Some of the "footing stones" or foundation stones needed to be removed. 2 bars needed for this one! Just a reminder of what was being replaced! 7. If their tongue is too short for a plant, they can bite a hole in the corolla and commit 'nectar robbery'! wings and bumping into others. A less romantic version of the waggle dance done by honey bees! Last month a colony of bees decided to make a nest in a cavity under the roof of our outside toilet block here at our office in Windermere. On closer inspection it turned out that these were no ordinary bees but were tree bumblebees (Bombus hypnorum) which were first seen in the UK in 2001 and have become naturalised. What made this sighting even more interesting was the fact it was only the 2nd tree bumblebee nest seen in the Lake District this year! We were able to study these bees really closely, from the comfort of a toilet seat, and watch them as they flew out of the nest and up towards the tree canopy near by. The bees always followed the same route to and from the nest, heading off towards a good food source. A large gap under the roof gave the tree bumblebees a warm and dry place to build a nest and form a colony. A tree bumblebee seen returning to the nest, pollen sacks fully laden. Tree bumblebees seem to like bird nestboxes for their colonies in other parts of the country, which to the bees is a close match to that of a nice dry cavity in a tree - exactly what a bird box is trying to replicate. Now that our bee-senses were tuned in to the activites of these beautiful creatures we looked around for more species. The flowers around our office were bowing under the weight of bees, and other insects trying to mimic them to avoid being eaten. We also saw bees that on first glance looked like flies because they lacked the bright colours used by bees to warn off anything that might think they were a tasty snack. A bee? or a fly? Answers on a postcard please! 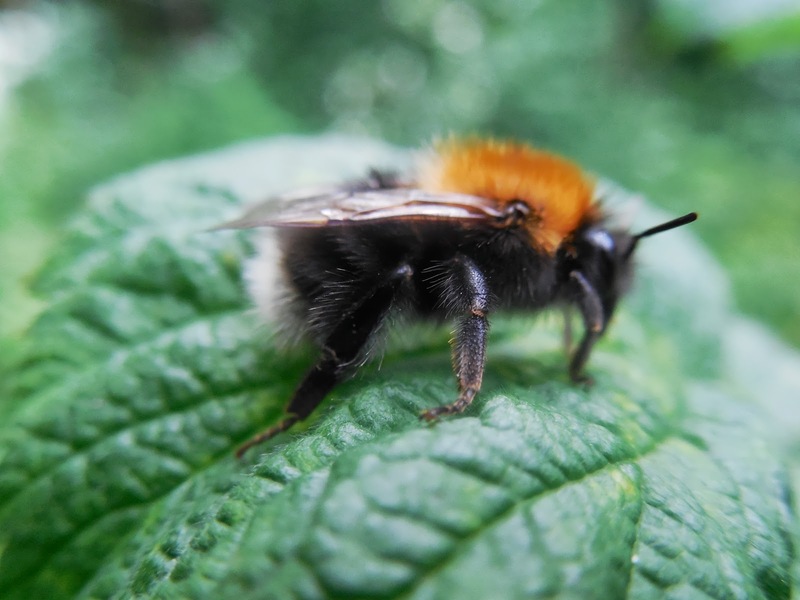 What can you do to help bumblebees? 3. Think very carefully before using herbicides, pesticides & fungicides. Cumbria National Trust Volunteers. Path work at Birdhouse Meadows. Rangers and Cumbria National Trust Volunteers working together to improve a popular riverside walk at Birdhouse Meadows. Sunday August 4th. Birdhouse Meadow is located at the North end of Windermere. The ground in places is very soft, and with so much useage by locals and visitors, the ground gets very boggy. It was decided to link the existing boardwalks with a hard surface. 15/30 stone from Elterwater was ideal. The rails will hold the stone in place and determine the width of the path. The finished section. Walkers were passing by and commenting on how good it looked. Another section close to being finished. A well earned break by the river. Looking Good. With Thanks to the Cumbria National Trust Volunteers for all their help in improving the ease of use and the looks of the footpath.